The timetable has been updated but is changing all the time, as new activities are added. Below is a basic list of the groups currently using the Hall. More details on the timetable. Please contact us for details about how to get in touch with the organisers of any activities which interest you. Fridays: Nursery Playgroup, Ballet/Dance School, Board Gamers Group. Evening mostly reserved for community events, but if available can be booked for private events. Saturday and Sunday: the Hall is available for single private events, such as parties. Contact our Bookings Co-ordinator for more information about Friday evening or weekend bookings. 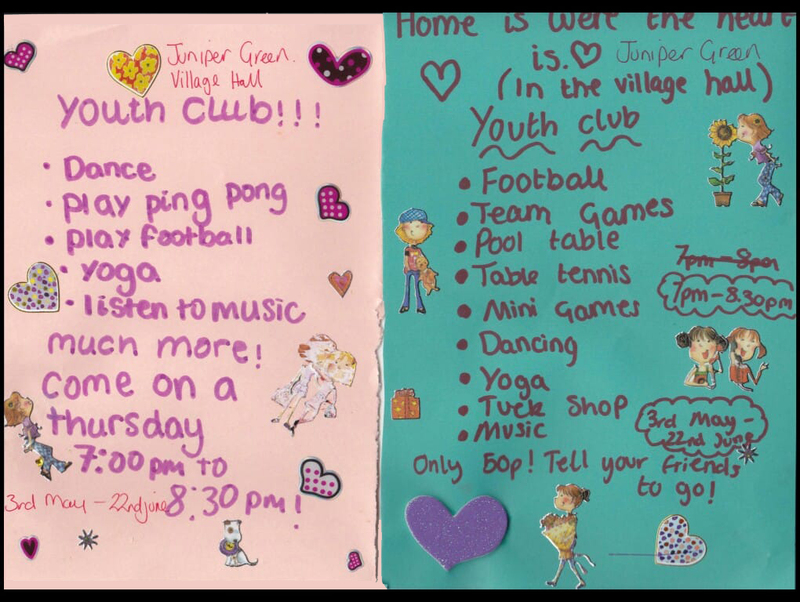 P5 – P7 kids all welcome! 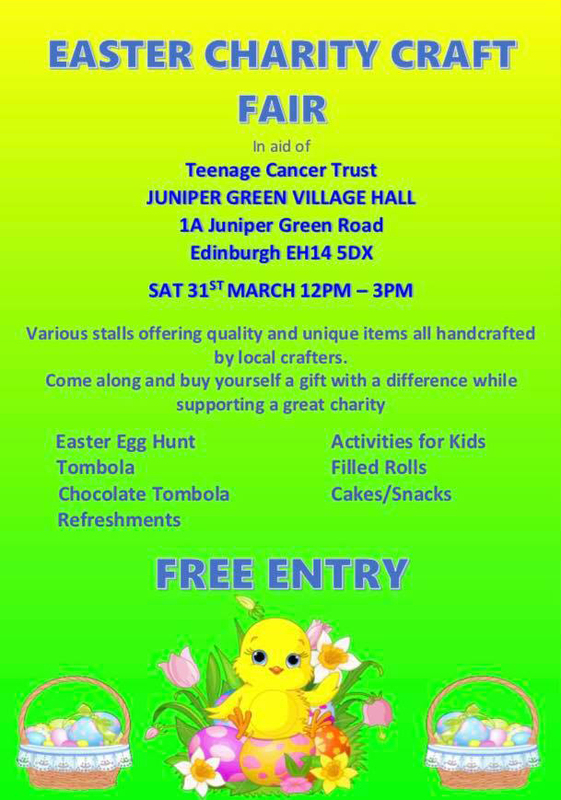 Dodgy ball, table tennis, pool, table football, cooking crafts, health & beauty, and “things”. Kids decide on the programme. 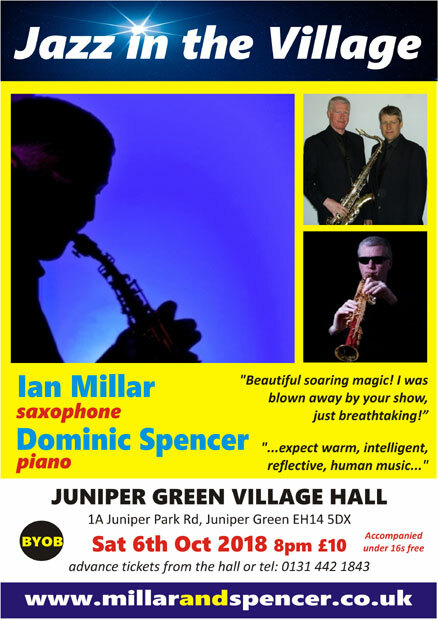 Jazz duo Ian Millar and Dominic Spencer have performed together for many years, playing melodic improvisations on jazz standards and original compositions. Tickets: £10pp (under 16s FREE if accompanied by an adult). Tickets available or the night, or can be bought in advance at the Hall when the janitor is on duty, Mon-Fri, afternoons/evening only – (0131)­ 458-3751 to check. Alternatively email JGVHO Events. Final date before breaking up for the summer holidays still TBC, but will be either Thursday 21st or Thursday 28th June. This will take place in our newly repaired (and re-opened at last!) Village Hall. See News page for more details. The Farmers’ Markets were suspended in May 2016 following the closure of Juniper Green Village Hall. At the time it was not clear whether, or when, the Hall would re-open. In the event, this took a year (minus one week!) and the Hall was re-opened on Thursday 27th April 2017 following the completion of the necessary repair work. The licence to operate the Farmers’ Markets expired during the closure period. If the Markets are to continue, it will be necessary to apply for a new licence. 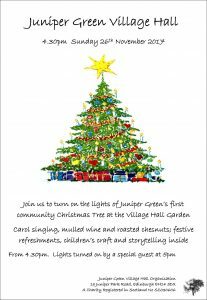 This will be a joint decision by Juniper Green Community Council and the company responsible for organising the Markets. or contact Juniper Green Community Council.